Last night, the low pressure being monitored for the past several days developed into the second tropical storm of the Atlantic hurricane season, Tropical Storm Bertha. Bertha will reach Barbados and the Lesser Antilles through today and could bring as much as 6" of rain for the Leeward Islands, Puerto Rico, and the Virgin Islands today and tomorrow. 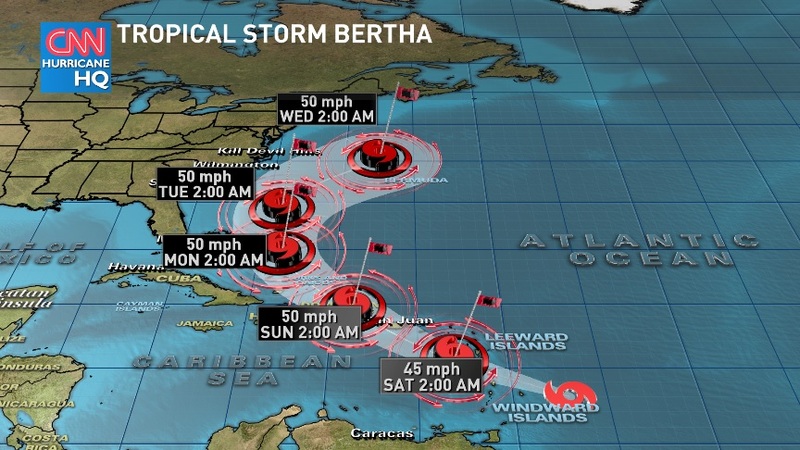 The forecast track brings the path of Bertha close to the US mainland before turning the storm before making landfall. Keep track of the latest developments by following Indra Petersons on twitter at @IndraPetersons or checking out CNN.com/Weather.